The issue? Impenetrable design. Manufacturers are increasingly designing electronics to be impossible to take apart, and one of the reasons for this is because the powerful batteries needed to run these devices are dangerous: they’re flammable, toxic and – when mishandled – potentially deadly. Designers make products impossible to take apart in order to protect consumers from being poisoned, burnt, or otherwise injured by the batteries inside them. But this is a practice that does enormous damage to the environment, is not sustainable, and needs to change. Our very own Jeffrey Ortega explores the issue of impenetrable design and the need for easier electronics repair in a recent article for R&D Magazine, making the argument that with silver-zinc batteries – which are non-toxic, non-flammable, and powerful enough to meet the energy requirements of even the most sophisticated small tech – designers no longer need to design products in an impenetrable way, thus paving the way for a recyclable electronics industry that is both sustainable and sensible. We hope you will read the article; it is a comprehensive exploration of a critically important issue. 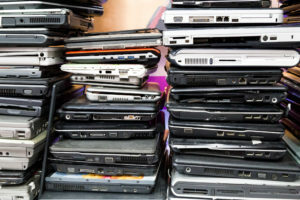 As technology becomes ever more sophisticated, and ever more prevalent, there will be billions more small electronic devices that will someday need to be disposed of. Whether they end up in a landfill or in a new device is up to us. Engineering Students – Don’t Miss Out On Your Chance at $25K! Enter the Battery Bowl Before It’s Too Late!